Emails have emerged in a federal lawsuit that suggest Republicans gerrymandered congressional districts in Michigan in 2011 to maintain an advantage over Democrats, despite years of claims the lines are drawn without political bias. The lawsuit references private emails that allegedly show one Republican aide saying a Macomb County district is shaped like “it’s giving the finger to (Democratic U.S. Rep.) sandy levin. I love it.” Another email from a GOP staffer was said to brag about cramming “Dem garbage” into four southeast Michigan congressional districts. In a third email, a longtime Michigan Chamber of Commerce executive predicts the maps will keep Republicans in power for years — and implies the 4th Congressional District in the central Lower Peninsula was drawn to the wishes of Dave Camp, a longtime Republican congressman from Midland who has since retired. The emails were introduced this month as evidence in the League of Women Voters of Michigan’s ongoing federal lawsuit alleging the 2011 state legislative and congressional maps are so gerrymandered they violate the U.S. Constitution. The messages highlight the influence of the Michigan Chamber and GOP consultants in drawing districts favorable to Republicans — and lift a curtain on a process that both Democrats and Republicans had insisted for years was unbiased. The emails are becoming public as the Michigan Supreme Court is poised to decide whether a citizen initiative to create an independent commission to draw districts can appear on the November state ballot. The court heard arguments last week and could make a ruling at any time. 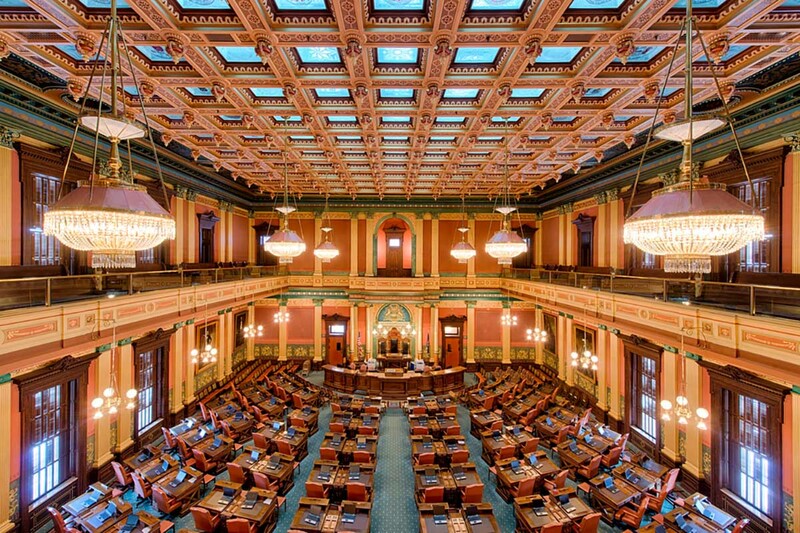 The ballot measure is opposed by Republican candidates for governor, including Attorney General Bill Schuette, and groups such as the Michigan Chamber, which contends the proposal is overly broad. The business group’s political arm, Michigan Chamber PAC II, has donated at least $135,000 to a separate group, Citizens Protecting Michigan’s Constitution, that filed suit to keep the measure off the ballot on claims the measure is so sweeping it requires a constitutional convention. The chamber has likewise been a heavy contributor to Republican-backed candidates to the state Supreme Court, which tilts 5-2 Republican. The chamber has said publicly it only seeks fairness and doesn’t support gerrymandering, even though LaBrant has long been recognized nationally as an expert in drawing districts to favor Republicans. “Would I say that we participated in a gerrymandering effort? No. Have we been involved in discussions every 10 years about redistricting? Yes,” Rich Studley, the chamber’s president and CEO, told Bridge Magazine in an interview Monday. But he and the chamber’s executive vice president, Jim Holcomb, said the discussions followed the law and accepted standards to draw districts. They said they had not seen the emails cited in the federal suit that suggest otherwise. Jeff Timmer, a GOP consultant who drew many of the districts, is a participant in many of the emails made public by the lawsuit. He didn’t respond to requests for comment this week, but defended the process at a conference this spring sponsored by The Center for Michigan, the nonprofit that publishes Bridge Magazine. He said then that redrawn legislative districts must satisfy a host of requirements, including keeping community boundaries intact, ensuring minority representation, maintaining contiguous borders and equaling the population of districts. “The fact that politics has politics involved in it is shocking to a lot of people,” said Timmer, who is a former state Republican Party director. Republican strategist Jeff Timmer, who drew many Michigan's existing voting districts, predicts the political climate should the Voters Not Politicians ballot initiative pass. He also suggests how to stop gerrymandering against your party. The emails provide a rare public glimpse into the horse trading and overtly partisan negotiations of drawing districts. In Michigan, political parties in control of the Legislature propose district lines that must be approved by the governor every 10 years after the Census. Because of population losses, Michigan’s congressional delegation shrunk from 15 to 14 following the 2010 Census. The emails were exchanged between GOP aides and consultants in the weeks before the new districts were unveiled in 2011. An early version of the map was drawn to give Republicans a 10-4 advantage in Congress, according to evidence in the lawsuit. Not a good idea, suggested LaBrant, the Michigan Chamber’s longtime senior vice president of political action and general counsel at the time. “We needed for legal and PR purposes a good looking map that did not look like an obvious gerrymander,” LaBrant wrote to Timmer on May 26, 2011, according to court documents. Earlier, Timmer wrestled with how best to draw Camp’s district, which ended up stretching nearly 150 miles from Roscommon County to just outside Lansing, while bypassing Democratic strongholds such as Bay City and Saginaw. “We have three options now (1) Saginaw Twp and no Frankenmuth, (2) Frankenmuth and no Saginaw Twp, and (3) both Saginaw Twp and Frankenmuth,” Timmer wrote to LaBrant on April 21, 2011. In the end, half of GOP-leaning Saginaw Township was included in the district, whose border juts out 20 miles to include Frankenmuth, which is “98 percent Republican,” said Paul Purcell, chairman of the Saginaw County Democratic Party. “This is a screwy district,” Purcell told Bridge this week. But even before redistricting, the district was solidly Republican, last electing a Democrat in 1933. In 2016, incumbent U.S. Rep. John Moolenaar, a Republican, defeated Democrat Debra Wirth by a nearly 2-1 margin. Camp, now a senior policy adviser with accounting firm PricewaterhouseCoopers, didn’t respond to messages from Bridge seeking comment. The Detroit News was the first to report on the existence of the emails, but several others have since been made public by the suit. Most provide little context and involve aides rather than elected officials. An aide to then-Congressman Thaddeus McCotter, R-Livonia, suggested tweaking borders in West Bloomfield in Oakland County and in Wayne County to satisfy “the obvious objective — putting dems in a dem district and reps in a gop district" and "increase the black population in the black districts." “In a glorious way that makes it easier to cram ALL of the Dem garbage in Wayne, Washtenaw, Oakland and Macomb counties into only four districts. Is there anyone on our side who doesn’t recognize that dynamic?” the same aide, Jack Daly, wrote to Timmer in May 2011. Daly did not return a call Tuesday from Bridge. The emails refer to congressional districts, but the lawsuit by the League of Women Voters also alleges gerrymandering of state House and Senate districts as well as political payback directed toward legislators who objected to the new lines. The suit alleges new methodologies of quantifying gerrymandering show Michigan has some of the most imbalanced districts in the nation. “This is gerrymandering in all its ugliness,” said Mark Brewer, attorney for the league. Brewer, who is also former chairman of the Michigan Democratic Party, acknowledged that Democrats also have been guilty of gerrymandering nationwide. LaBrant and his attorney, Gary Gordon, did not respond to requests for comment. This spring, at The Center for Michigan conference, Timmer argued against the Voters Not Politicians ballot measure that would take redistricting out of the hands of politicians and leave those decisions to an independent citizens panel. Timmer said that such a panel would prove rife with “corruption,” “lobbying, politics and payoffs” and would attract court challenges claiming its members don’t fairly represent Michigan. “The morass of lawsuits and uncertainty that will arise from this is simply staggering,” he said at the time. He said those who don’t like the process have “recourse, and it’s called elections,” adding that political districts merely reflect self-segregation, and not partisanship. GOP consultant Jamie Roe was also involved in several emails, including the one in which LaBrant guarantees a 9-5 delegation. The emails are emerging as the Michigan Chamber finds itself on the defensive over the Voters Not Politicians’ redistricting measure. It’s the largest funder of the group fighting the ballot measure in court, and the chamber recently was the target of a provocative ad campaign and protests against Deloitte, whose Michigan managing partner, Mark Davidoff, is chairman of the chamber board. LaBrant has been outspoken for years about drawing districts to help Republicans. He was hailed as a “genius who first recognized — and fought for — every element of the modern Republican redistricting strategy” in the 2016 book, “Ratf**ked: Why Your Vote Doesn't Count” by David Daley. “Perhaps no individual has done more than LaBrant to shape Michigan politics,” Daley wrote of LaBrant’s influence in the state over several decades. LaBrant retired from the chamber in 2012. Studley, the chamber’s CEO, told Bridge his group is funding opposition to the Voters Not Politicians measure because it has questions about the measure’s constitutionality. “Gerrymandering has come to take on a very negative connotation to really be used as a pejorative,” Studley said. Chamber leaders told Bridge they did not recall the emails involving LaBrant produced in the lawsuit. The chamber was subpoenaed in the case, and couldn’t find any documents to turn over, said Holcomb, the chamber’s executive vice president. But Josh Silver, director of Represent.Us, a national elections reform group that bought the ad blasting the chamber, said the chamber’s arguments don’t pass the smell test. Proving once again that the Republicans in Michigan are a bunch of redneck racists. In this case, it would be more accurate to say “When you have power, you abuse it." And that's the real issue here; ... Seeing fairness as weakness, and feeling guilty only about being caught, rather than about the crime itself. And yes; "both sides" have done it, but only one side does it constantly and brags about it, and does it very specifically to weaken the power of certain ethnic groups who they consider inferior. It makes no sense that my home is West Bloomfield is in the same Congressional district as my birth home in Northeast Detroit. The district resembles a gerrymandered salamander. The genius of the framers of the Constitution is evident in nothing so much as their cynicism regarding human nature. Year after year, experience has borne out their certainty that if unchecked the powerful would act in their own interest to the detriment of the general welfare. This is clearly evident in regard to the creation of legislative districts. If parties in power are unchecked, they will totally distort the political process to benefit themselves in an attempt to perpetuate a permanent majority. The only way to effectively check this is to take the reapportionment process out of the hands of politicians to the maximum extent possible. We cannot trust the politicians--of every party--to automatically act in our interests. It is extremely difficult to take politics out of what is essentially a political process. Neither side can argue that their party has never been involved in gerrymandering. At the same time, neither side wants to give up the ability to be in charge of the district defining process. I view the VNP attempt as a Democratic attempt to take over the process when the current legislature looks to be in Republican hands for a while. You can argue that the proposed commission is intended to be neutral or non-partisan or whatever you want to call it, but I argue that a non-partisan person does not exist. We all have feelings, however slight, toward one party or the other. A better way, in my opinion, would be to agree on a set of rules, and let a computer draw the districts. An example of rules could be that all districts must be equal population within a small percentage, political or geographic boundaries should not be crossed when drawing a district, and the districts must be approximately rectangular in shape. Once you agree on the rules, then remove people from drawing the districts and there can be no claim of gerrymandering. "Let a computer draw the districts?" Non-partisan computers don't exist, either; they don't think and function by themselves. We cannot avoid the human element. Your proposed rules (among others) make sense for a redistricting committee, however. I believe you are overly cynical regarding improving the redistricting process. I congratulate Voters Not Politicians (VNP) for their incredible grass roots effort; citizen by citizen, door by door. If common citizens are prevented from putting a simple ballot measure before the people to vote on, frankly, what democratic principles are left regarding how we govern ourselves? And if so, it would clearly show that the Michigan Chamber of Commerce is the decider of Michigan law and not the Michigan Supreme Court, since the court would be in the pocket of the Chamber. If the ballot measure gets on the ballot and passes, no doubt rules will have to be promulgated, by this new commission. Who’s to say they wouldn’t employ a computer-driven model to start with, as you suggest; since you do need a starting point in this process. Arjay...The VNP initiative calls for a commission comprised of four self identifying Democrats, four Republicans and five independents, drawn randomly from voter registration rolls. The procedure this commission decides on to determine district lines may very well utilize the computer model you suggest. Did you have the chance to attend any of the informational presentations offered by VNP? Before you decide how you're going to vote, I hope you will research the initiative, visit the VNP site or even call and talk to someone. As you said, we are political animals with certain leanings. VNP recognizes this and has framed the initiative to remove as much of the bias as possible. So essentially, the same process used to pick jurors (and I don't know of anyone who WANTED to be chosen for that) is the same process to be used to determine voting districts throughout Michigan for the next decade. We might even have a balanced electoral map - I guess that's wrong as far as you are concerned. Michigan is acknowledged (I'll leave it up to you to check the archives of the Bridge) to be the most gerrymandered state in THE COUNTRY. I guess any attempt to fix that fix is 'wrong' for you? I never said that it wasn't broken, Rick. Just that the "solution" being proposed doesn't really address the problem. I'd also recommend looking at Illinois. They easily give Michigan's districts a run for their money. I've also mention before that politicians carefully craft everything that they say in order to assure that they can get as many people to vote for them as they can. Why would the five "independents" be any different? Reading this made me sick to my stomach. Voters Not Politicians is doing us a service by eliminating this back room horse trading once and for all. If the Michigan Supreme Court does not allow a vote of the people to end this odious and undemocratic practice along party lines can we really have any faith in the judiciary as impartial? Are the justices of the Michigan Supreme Court no better than the partisan political hacks in the legislature who can be bought and sold?The integrity of our entire state judicial system is at stake. We will soon know. And I suspect that the SC will follow the Mi GOP line and vote against democracy, votes, etc. Surprised that no one has mentioned that two of the Supreme Court Justices appointed by Governor Snyder are up for reelection this fall and both of them took campaign contributions from the Michigan Chamber of Commerce. They must recuse themselves from hearing this case. The League of Women Voters is really in no position to talk about "giving the finger" to anyone. They were instrumental in doing the same to Michigan Voters when we passed Term Limits on ALL elected officials (read: state AND federal) back in 1992. This meant politicians had to eventually live under the same laws that they intended for everyone else. Since the federal government is a creation of the states, and under Art 1, Section 4. we were well within our rights to determine just how long politicians can stay in office, it really was a no-brainer. The League of Women Voters felt differently and sued to have the voters overturned. Sadly, they were successful with US Term Limits v. Thornton. The League of Women Voters did not say they were giving the finger to anyone - that was a Republican staffer in the office of Rep. Thaddeus McCotter. Term limits have been an absolute disaster for Michiganders and have helped lead to the rise of power for special interests, including the Michigan Chamber of Commerce. "Emails have emerged in a federal lawsuit that suggest Republicans gerrymandered congressional districts in Michigan in 2011 to maintain an advantage over Democrats, despite years of claims the lines are drawn without political bias. The emails were introduced this month as evidence in the LEAGUE OF WOMEN VOTERS OF MICHIGAN'S ongoing federal lawsuit alleging the 2011 state legislative and congressional maps are so gerrymandered they violate the U.S. Constitution." The League of Women voters didn't really need to say anything. Their actions in telling what Michigan Voters could go and do with ourselves was readily apparent with their actions in US Term Limits v. Thornton back in '92. So tell me, Samatha? If term limits are as bad as people make them out to be, then please explain the resounding "success" at this link below? When America was founded, public service was to have been a brief interruption in someone career. NOT a career all by itself. Not only do we have "experienced" politicians who have essentially turned this axiom on its head, but it further degenerated into dynastical political families (i.e. Levin, Dingell, Conyers, Kilpatrick, Young, Schumer, Reid & Pelosi) who are re-elected solely on name recognition over actual political accomplishment. Mr. Posthumus' piece a few days ago illustrates the problem with "experienced" politicians like Rep. Greimel who still don't even understand the basic functions of how government actually works. If you're looking for someone to blame for the problems in government, blame it on the people who don't know how to do the very job that they ran for. Maybe McCotter's aide should've been more worried about re-election. My own, oft repeated bromide is that the state legislature is the body charged with redistricting, and that any scheme for redistricting will be partisan, so let the majority screw the losers. 1) I'd intuit that Democratic districts lose population during any 10 year cycle. They then represent fewer people upsetting the balanced voting district dictum. 2) It is likely that a completely neutral commission will change lines around without regard to the political history; many more will have to change their district and representatives, upsetting investments by both inhabitants and the politicians in their comfort and trust in each other. "It is likely that a completely neutral commission will change lines around without regard to the political history; many more will have to change their district and representatives, upsetting investments by both inhabitants and the politicians in their comfort and trust in each other." Give me a break. That is exactly what has been happening under the current model. To an extent, but as soon as the Supreme Court gutted the Voting Rights Act, Republicans went crazy with it and every other form of subtle voter suppression they can come up with. Gerrymandering at its best for the times. Now they use big data and computer modeling to create districts like the "snake along the Lake," in Ohio. Even a blind squirrel would know that district was and is gerrymandered. When will the federal courts way in eliminating the use of blatant wrongdoing and the use of big data in conjunction with computer modeling turning the election process back to the rightful owners the voters instead of career politicians and paid political hacks? So now Democrats suddenly care about emails. They don't care when Hillary's emails show how they used the superdelegates to force Bernie out of the running (effectively ensuring that the people don't have a vote). No they care when it's a dumbass Republican......... wake up slaves, the privileged rich politicians are both gaming the system and we're their pawns! Mr. Timmer seems extremely desperate to insuring the current corrupt system of gerrymandering, that benefits him personally and his personal interests, stays in place. That's downright un-American. I totally agree with Voters Not Politicians and they better let the People decide the measure. "Suggest" ? If you don't know, how in hell are WE supposed to benefit from your info.? Voters Not Politicians petition was done by NON PARTISANS that Live in this State and have DECADES of election experience. The only thing I can fault with the article is that they did not mention who really funds & runs Chamber of Commerce. KOCH's do and we've seen literally 100's of Koch ALEC laws rammed down our throats in Michigan. To allow Koch's or any other entity to continue voting repression and obstruction in this State is a CRIME against the people. Actions always speak louder than words. ALWAYS. It is not just this president or just this administration, it is the Republican party in general. They built Trump. Brick by brick. Stone by stone. Policy by policy. They enable him to this day. They aid and abet his criminal activities day by day. He and way too many of them attack our institutions every day. Our education system is under attack. Freedom of the press is under attack. An independent judiciary is under attack. Our National Intelligence and Security Agencies are under attack. The independence of our Department of Justice is under attack. Our national electoral process is under attack and this administration and this Republican-controlled Congress do nothing except attack those who are trying to find out the truth and fix the problem. The only thing #45IsIllegitimate had right during the campaign (and since) is that the election was “rigged”. It WAS rigged, just not as he implied. AND NOT JUST BY FOREIGN POWERS. Extreme gerrymandering, voter suppression laws, and Crosscheck Purging, if YOUR party has to use these unAmerican tactics what does it say about YOUR party and their agenda? If YOU support these unAmerican tactics what does it say about YOU. Today’s Republican Party has become the party of lies, fear, and hate. Today’s Republican Party is ‘A Clear and Present Danger’ to our country and our way of life. Vote. Vote Blue. Vote in every election from local to national. EVERY ELECTION. The irony of gerrymandering is this: once a candidate has won a primary of the party in power, they are insured of that office AND ARE ONLY BEHOLDING TO THIER BIG DONORS. They do not have to vote in the interests of the people who elected them. Listen to all the phony Republiican arguments about "that's just politics." Writing's on the wall, Repubs. You can't win anymore ethically. Demographics are changing. You do not represent the majority, statewide or nationally. Your Alamo was repealing the Voters' Rights Act. So now citizens are not going to rest until they get their rights. Its not self segregation. We dont move into neighborhoods based on politics. Its the remnants of redlining and the ghettofication of POC neighborhoods.